As I mentioned in Tuesday’s post, on Monday I finally had all of my light fixtures installed!! It was the BEST day. I don’t mean to sound obnoxious, but it’s actually crazy how much decorative lighting can transform a space. 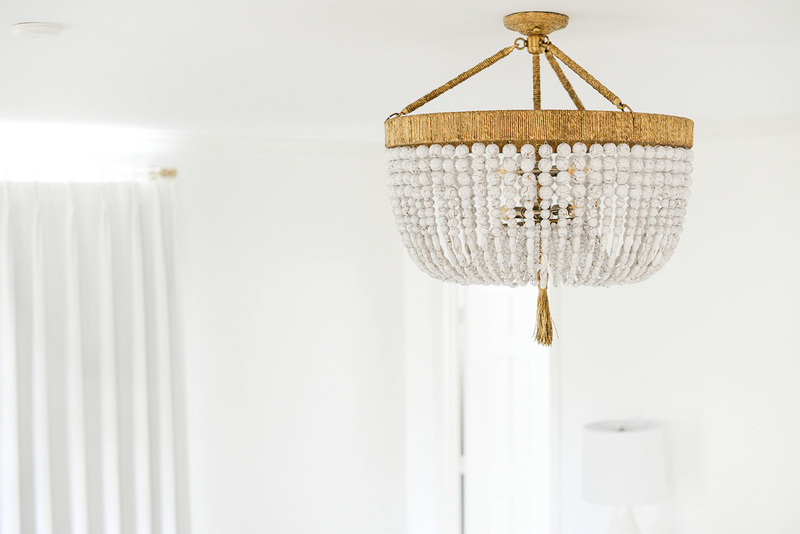 The chandelier I’m most excited about is this beaded beauty I worked on with Ro Sham Beaux for my master bedroom! Because of my lower-height ceilings, I had absolutely zero luck finding a fixture that didn’t dominate the space or hang too low. 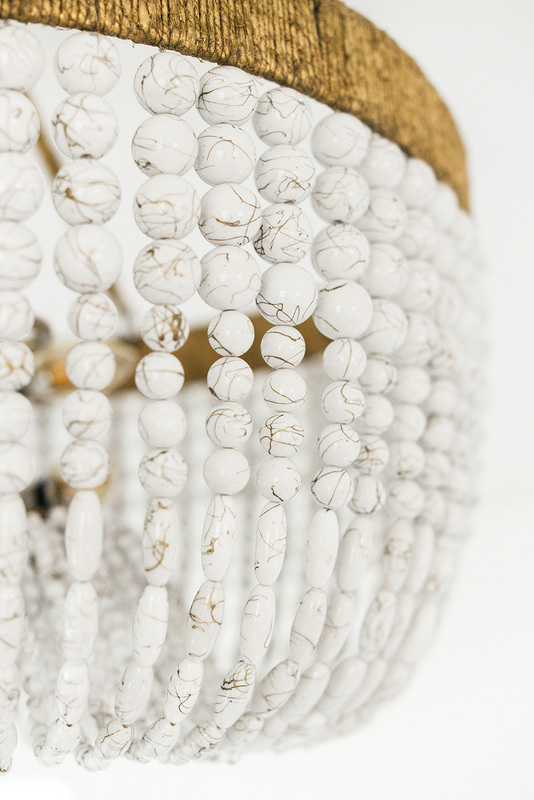 That’s when one of my lovely readers turned me onto Ro Sham Beaux, a Charleston-based lighting company who specializes in custom chandeliers, pendants and other fixtures. Ro Sham Beaux has so many gorgeous styles/bases to choose from, but they also do completely custom projects if you have something specific in mind. For my fixture we decided on the Malibu frame, simply because it made the most sense regarding the height and width I needed. I also really loved how streamlined this style was – I thought it would look beautiful with the other clean lines happening in my master bedroom. While there were so many beading and three hemp options to choose from, I narrowed it down to the white + gold swirl beads and gold hemp to tie into the gold and white already happening in the space. It truly could not be more perfect! If I hadn’t picked such a bright blue headboard fabric already, I might’ve chosen the Cloud Jade stones – they are so pretty in person!! 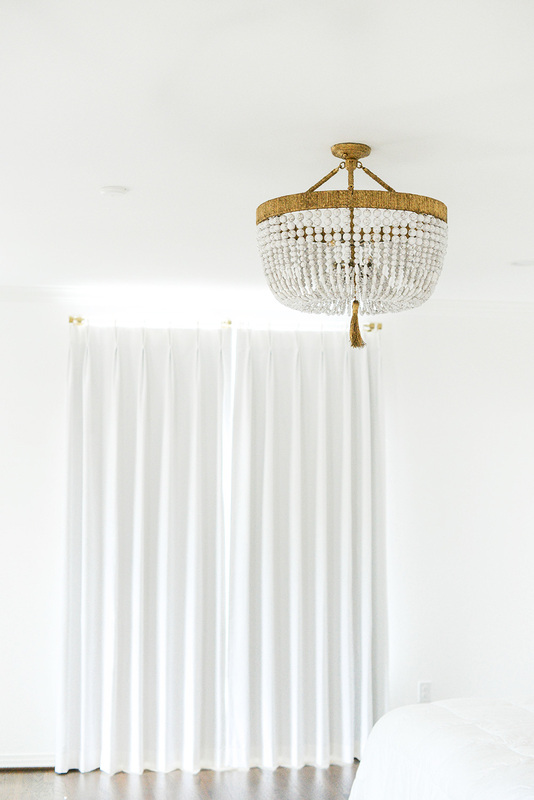 I just love how my Ro Sham Beaux chandelier really ties the whole space together, and I also love how the casual-glam silhouette softens the more modern touches (like my nighstands) around the room. It’s the chandelier of my dreams!! Stay tuned for a full master bedroom room reveal on the blog later this fall. I’m still working on my bedding, fabrics, art and other furniture (floor mirror, seating area, etc), but it’ll be awhile until I completely finish the space. 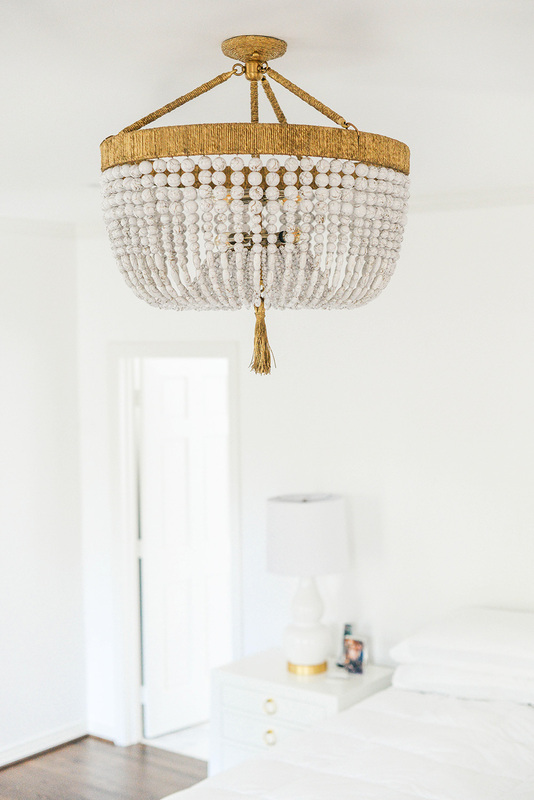 In the meantime, I hope you enjoyed getting a sneak peek of my room and seeing my fabulous Ro Sham Beaux chandelier! I highly recommend checking out Ro Sham Beaux and using them for your next lighting project. Click here to discover all that Ro Sham Beaux has to offer! A HUGE thank you to Calli and the rest of the Ro Sham Beaux team for bringing this project to life! That chandelier is gorgeous! Can’t wait to see how everything looks! I love that! I too am excited to see how it all looks! You have such great style! this is so dreamy, merritt! love! 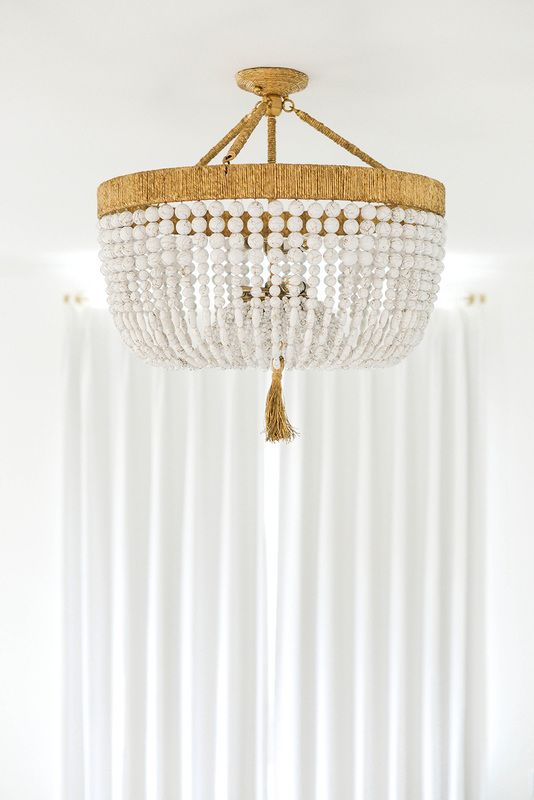 Would you mind sharing the size of your Ro Sham Beaux chandelier? Thank you! Sure! I got the Malibu 30 style and customized it so that it would only be 24 inches high (by doing a semi-flush mount). Thanks for the details!! I am planning to order something similar. Could you please share where you purchased your white curtains?